The original blog posted May 26, 2016, omitted option initrandom from the bayesmh command. The code and the text of the blog entry were updated on August 9, 2018, to reflect this. MCMC algorithms used for simulating posterior distributions are indispensable tools in Bayesian analysis. A major consideration in MCMC simulations is that of convergence. Has the simulated Markov chain fully explored the target posterior distribution so far, or do we need longer simulations? A common approach in assessing MCMC convergence is based on running and analyzing the difference between multiple chains. This post was written jointly with Yulia Marchenko, Executive Director of Statistics, StataCorp. As of update 03 Mar 2016, bayesmh provides a more convenient way of fitting distributions to the outcome variable. By design, bayesmh is a regression command, which models the mean of the outcome distribution as a function of predictors. There are cases when we do not have any predictors and want to model the outcome distribution directly. For example, we may want to fit a Poisson distribution or a binomial distribution to our outcome. This can now be done by specifying one of the four new distributions supported by bayesmh in the likelihood() option: dexponential(), dbernoulli(), dbinomial(), or dpoisson(). Previously, the suboption noglmtransform of bayesmh‘s option likelihood() was used to fit the exponential, binomial, and Poisson distributions to the outcome variable. This suboption continues to work but is now undocumented. For examples, see Beta-binomial model, Bayesian analysis of change-point problem, and Item response theory under Remarks and examples in [BAYES] bayesmh. We have also updated our earlier “Bayesian binary item response theory models using bayesmh” blog entry to use the new dbernoulli() specification when fitting 3PL, 4PL, and 5PL IRT models. Item response theory (IRT) is used for modeling the relationship between the latent abilities of a group of subjects and the examination items used for measuring their abilities. Stata 14 introduced a suite of commands for fitting IRT models using maximum likelihood; see, for example, the blog post Spotlight on irt by Rafal Raciborski and the [IRT] Item Response Theory manual for more details. In this post, we demonstrate how to fit Bayesian binary IRT models by using the redefine() option introduced for the bayesmh command in Stata 14.1. We also use the likelihood option dbernoulli() available as of the update on 03 Mar 2016 for fitting Bernoulli distribution. If you are not familiar with the concepts and jargon of Bayesian statistics, you may want to watch the introductory videos on the Stata Youtube channel before proceeding. We use the abridged version of the mathematics and science data from DeBoeck and Wilson (2004), masc1. The dataset includes 800 student responses to 9 test questions intended to measure mathematical ability. This post was written jointly with Nikolay Balov, Senior Statistician and Software Developer, StataCorp. A question on Statalist motivated us to write this blog entry. Our initial reaction to this question was ‘No’ or, more precisely, ‘Not easily’—hurdle models are not among the likelihood models supported by bayesmh. One can write a program to compute the log likelihood of the double hurdle model and use this program with bayesmh (in the spirit of http://www.stata.com/stata14/bayesian-evaluators/), but this may seem like a daunting task if you are not familiar with Stata programming. 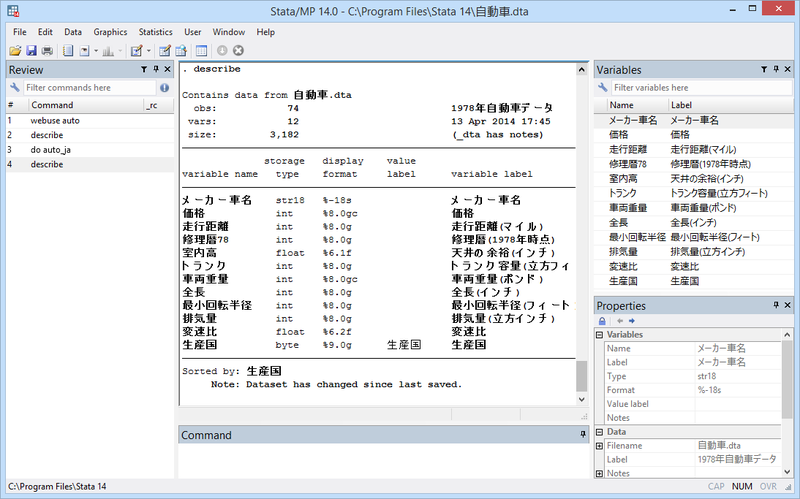 We’ve just announced the release of Stata 14. Stata 14 ships and downloads starting now. I just posted on Statalist about it. Here’s a copy of what I wrote. Stata 14 is now available. You heard it here first. There’s a long tradition that Statalisters hear about Stata’s new releases first. The new forum is celebrating its first birthday, but it is a continuation of the old Statalist, so the tradition continues, but updated for the modern world, where everything happens more quickly. You are hearing about Stata 14 roughly a microsecond before the rest of the world. Traditions are important. Here’s yet another example of everything happening faster in the modern world. Rather than the announcement preceding shipping by a few weeks as in previous releases, Stata 14 ships and downloads starting now. Or rather, a microsecond from now. Some things from the past are worth preserving, however, and one is that I get to write about the new release in my own idiosyncratic way. So let me get the marketing stuff out of the way and then I can tell you about a few things that especially interest me and might interest you. The above list is not complete; it lists about 30% of what’s new. For all the details about Stata 14, including purchase and update information, and links to distributors outside of the US, visit stata.com/stata14. If you are outside of the US, you can order from your authorized Stata distributor. They will supply codes so that you can access and download from stata.com. I want to write about three of the new features ‒ Unicode, more than 2-billion observations, and Bayesian analysis. Unicode is the modern way that computers encode characters such as the letters in what you are now reading. Unicode encodes all the world’s characters, meaning I can write Hello, Здравствуйте, こんにちは, and lots more besides. Well, the forum software is modern and I always could write those words here. Now I can write them in Stata, too. For those who care, Stata uses Unicode’s UTF-8 encoding. Anyway, you can use Unicode characters in your data, of course; in your variable labels, of course; and in your value labels, of course. What you might not expect is that you can use Unicode in your variable names, macro names, and everywhere else Stata wants a name or identifier. Your use of Unicode may not be as extreme as the above. It might be enough just to make tables and graphs labeled in languages other than English. If so, just set the variable labels and value labels. It doesn’t matter whether the variables are named übersetzung and kofferraum or gear_ratio and trunkspace or 変速比 and トランク. I want to remind English speakers that Unicode includes mathematical symbols. You can use them in titles, axis labels, and the like. Yes, the option really is named badidea and it is not optional. Another unicode command can restore the backups. It won’t take long to figure out which encoding works best. Stata/MP now allows you to process datasets containing more than 2.1-billion observations. This sounds exciting, but I suspect it will interest only a few of you. How many of us have datasets with more than 2.1-billion observations? And even if you do, you will need a computer with lots of memory. This feature is useful if you have access to a 512-gigabyte, 1-terabyte, or 1.5-terabyte computer. With smaller computers, you are unlikely to have room for 2.1 billion observations. It’s exciting that such computers are available. We increased the limit on only Stata/MP because, to exploit the higher limit, you need multiple processors. It’s easy to misjudge how much larger a 2-billion observation dataset is than a 2-million observation one. On my everyday 16 gigabyte computer ‒ which is nothing special ‒ I just fit a linear regression with six RHS variables on 2-million observations. It ran in 1.2 seconds. I used Stata/SE, and the 1.2 seconds felt fast. So, if my computer had more memory, how long would it take to fit a model on 2-billion observations? 1,200 seconds, which is to say, 20 minutes! You need Stata/MP. Stata/MP4 will reduce that to 5 minutes. Stata/MP32 will reduce that to 37.5 seconds. By the way, if you intend to use more than 2-billion observations, be sure to click on help obs_advice that appears in the start-up notes after Stata launches. You will get better performance if you set min_memory and segmentsize to larger values. We tell you what values to set. There’s quite a good discussion about dealing with more than 2-billion observations at stata.com/stata14/huge-datasets. After that, it’s statistics, statistics, statistics. Which new statistics will interest you obviously depends on your field. We’ve gone deeper into a number of fields. Treatment effects for survival models is just one example. Multilevel survival models is another. Markov-switching models is yet another. Well, you can read the list above. Two of the new statistical features are worth mentioning, however, because they simply weren’t there previously. They are Bayesian analysis and IRT models, which are admittedly two very different things. IRT is a highlight of the release and for some of it you will be the highlight, so I mention it, and I’ll just tell you to see stata.com/stata14/irt for more information. Stata fits continuous-, binary-, ordinal-, and count-outcome models. And linear and nonlinear models. And generalized nonlinear models. Univariate, multivariate, and multiple-equation. It provides 10 likelihood models and 18 prior distributions. It also allows for user-defined likelihoods combined with built-in priors, built-in likelihoods combined with user-defined priors, and a roll-your-own programming approach to calculate the posterior density directly. MCMC methods are provided, including Adaptive Metropolis-Hastings (MH), Adaptive MH with Gibbs updates, and full Gibbs sampling for certain likelihoods and priors. It’s also easy to use and that’s saying something. There’s a great example of the new Bayes features in The Stata News. I mention this because including the example there is nearly a proof of ease of use. The example looks at the number of disasters in the British coal mining industry. There was a fairly abrupt decrease in the rate sometime between 1887 and 1895, which you see if you eyeballed a graph. In the example, we model the number of disasters before the change point as one Poisson process; the number after, as another Poisson process; and then we fit a model of the two Poisson parameters and the date of change. For the change point it uses a uniform prior on [1851, 1962] ‒ the range of the data ‒ and obtains a posterior mean estimate of 1890.4 and a 95% credible interval of [1886, 1896], which agrees with our visual assessment. I hope something I’ve written above interests you. Visit stata.com/stata14 for more information.